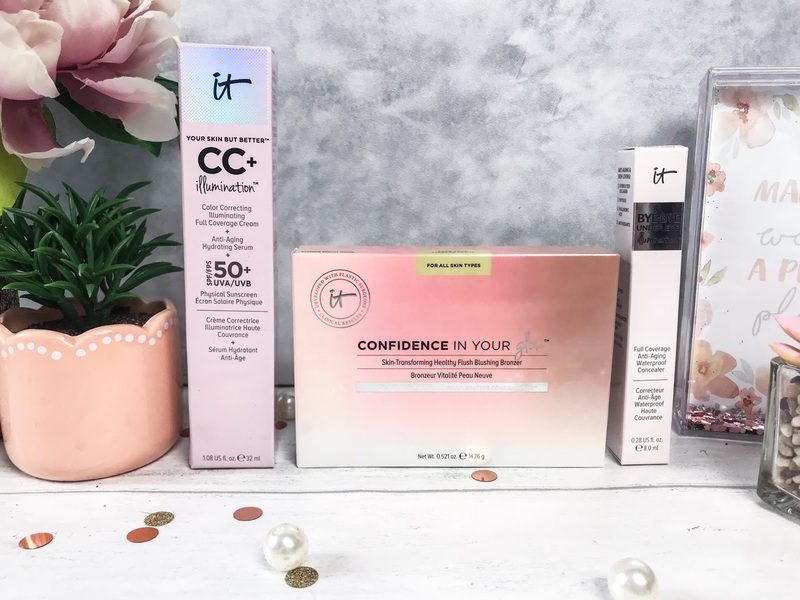 A cosmetics and skincare brand which I have used for well over a year now, but one which has only recently started to become much more accessible here in the UK, is the American brand IT Cosmetics. 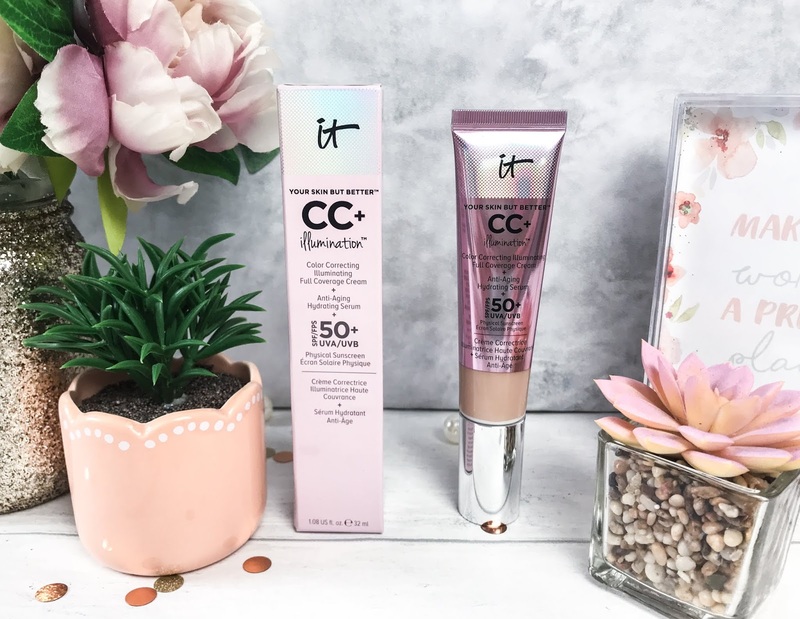 One of their most renowned products is the IT Cosmetics Your Skin But Better CC+ Full Coverage Cream, and they recently added an illumination version, which is going to be perfect for Spring, Summer and beyond. The IT Cosmetics Your Skin But Better CC+ Full Coverage Cream is going to be your go-to Summer foundation. It has the exact same formula as the best-selling original, so it still has the SPF 50+, but infused with micronised light-reflecting pigments for a subtle touch of radiance without the use of glitter or shimmer. This product was developed with plastic surgeons and is an all-in-one one step product to colour correct the skin with illuminating full coverage, anti-ageing skincare and SPF 50+ UVA/UVB broad-spectrum physical sunscreen. CC+ Cream has been created with hydrolysed collagen, peptides, niacin, hyaluronic acid, antioxidants and vitamins, so not only is it making your skin look amazing, it is also taking extra good care of it to keep it looking great even when you aren’t wearing the Cream. I have been using the Illumination version for a couple of weeks now and my skin feels so much more hydrated and softer than with regular foundations. I have quite large pores, but the CC+ Illumination doesn’t show off my pores, but instead helps them to appear smaller, so that is definitely a personal winner for me. There are currently seven shades of this available, and in Winter I tend to go for the Fair option, but as my skin is warmer toned at the moment due to the sunshine, I prefer the Light colour. The CC+ Cream comes in a pump tube, and you get 32ml of product and I have found previously that a tube tends to last me quite a while as with it being a full coverage cream, you don’t need to use lots of product at a time. With the Your Skin But Better having a strong SPF in the formula, this is definitely the perfect Summer holiday product to get you looking super healthy, naturally glowy all whilst knowing it is babysitting your skin! Along with the CC+ Cream, IT Cosmetics have also released an illuminating version of their Bye Bye Under Eye Full Coverage Concealer, the Illumination update (£23.50). Available in six shades, this time I opted for the Light again, which states it is for Ultra Fair skin, as I often prefer a lighter shade under my eyes to make them appear brighter. Bye Bye Under Eye is honestly one of the fullest coverage concealers I have come across, it is highly pigmented and this time it contains Drops of Light Technology for added radiance. 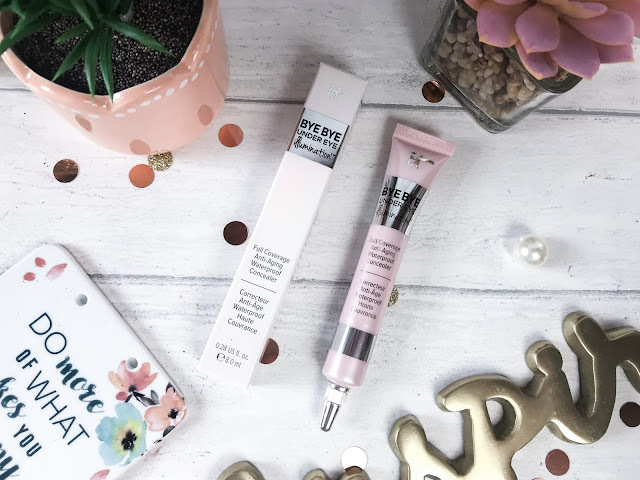 This concealer effectively covers the appearance of dark circles, bags, redness, broken capillaries and other imperfections and is full of peptides, vitamins, antioxidants, hydrolysed collagen and hyaluronic acid to take care of such a delicate area. Bye Bye Under Eye covers my oh-so-dark circles perfectly and once applied it doesn’t crack or crease and stays on throughout the day. As with the CC Cream, this concealer contains SPF 50+ which is a must-have for the eye area and actually increases hydration levels rather than drying the area out like other concealers can do. There are various ways to use this product, including using it as a full base before a foundation or CC cream to give the ultimate complexion perfection. 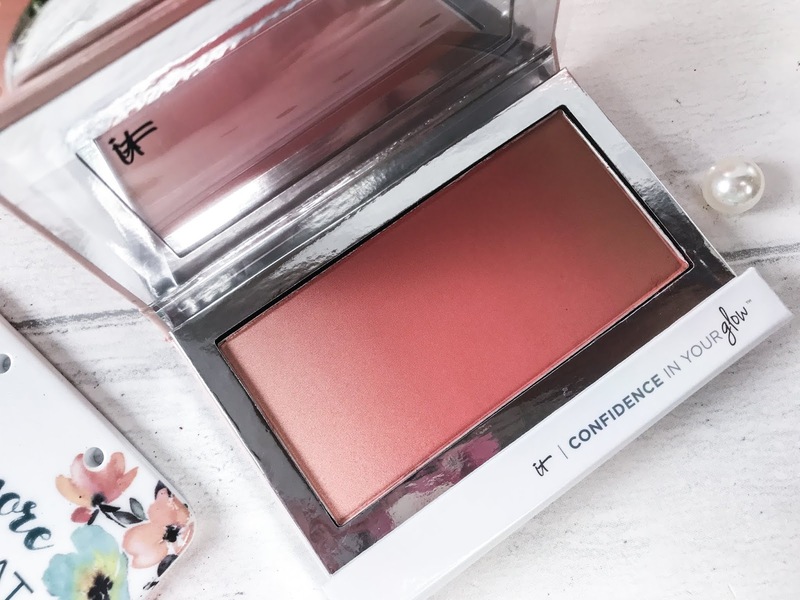 Once you have the perfect base, I then go onto the IT Cosmetics Confidence in your Glow Skin-Transforming Healthy Flush Blushing Bronzer (£25) - phew what a name! This sweet compact contains a mixture of highlighter, blush and bronzer so is the perfect multi-use product for on the go. Confidence in your Glow is suitable for all skin types and tones to transform the complexion with anti-ageing ingredients and talc-free ultra-luxe pigments plus those all-star Drops of Light Technology. There are three shades available, and here I have Instant Warm Glow, which goes from a light peach, through to a warm bronze shade, in a pretty ombre effect. The palette has a mirror on the inside of the lid for desk to dance floor application and each colour can be used individually or all three swirled together to give you the most natural, yet stunning warmth to the face. It can look quite dark in the pan, but even though I am fair-skinned, this really works for me, improving my skin’s texture and airbrushing and minimising this pesky pores I suffer so much with. 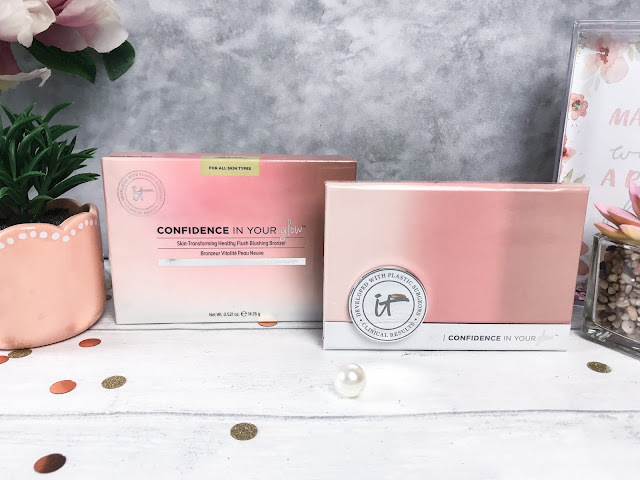 IT Cosmetics ethos is really inspiring, as they create products to help women not only look their best, but feel their best too - their products are real confidence boosters, and they care as much about the purchaser’s well-being and skincare as they do about how well the product performs and how gorgeous the packaging looks, they really are a very inspirational brand and we are so lucky to be able to have access to their products much more readily now. IT Cosmetics are available at retailers including QVC, Boots and Selfridges.